Whether you travel twice per year or two hundred times a year, there are some travel items that are essential to have to survive your time on the road. 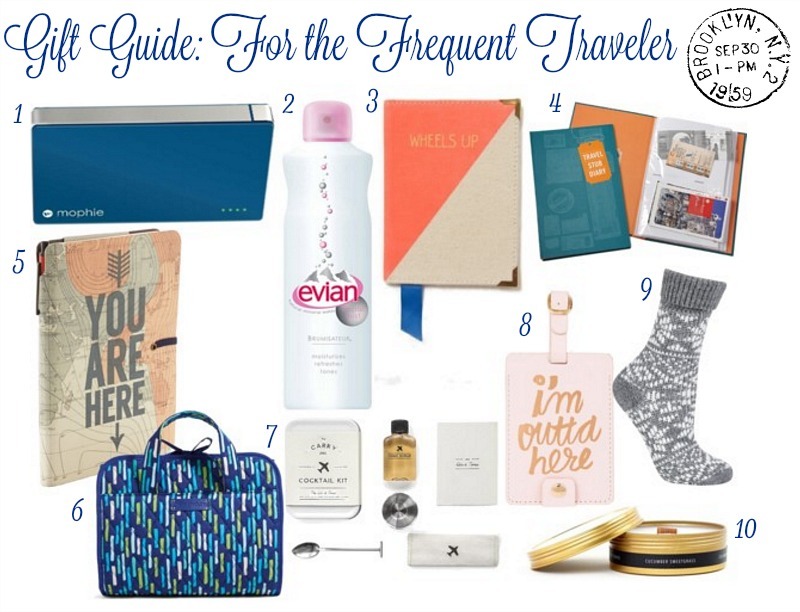 If you have a jet setter on your gift list, make the holiday one to remember with one of these gifts. 1. A portable charger is a MUST when on the road. The mophie Powerstation accommodates just about any USB device in the world. 2. Air travel strips skin of its natural oils. Evian Facial Water Spray replenishes the skin after long flights to keep it hydrated and looking fresh. 3. Personalize your passport and set it apart from the rest of them on the plane with a cute cover. 4. Keep momentos neatly preserved with this travel stub diary which holds ticket stubs, receipts, and photos. 5. I love jotting down notes on what I did, where I ate, and special memories in a cute travel journal. 6. While on vacation, I bought this hanging travel organizer by Vera Bradley, and it is perfection! It's roomy with 2 clear pockets, a large pocket, and one expandable pocket. It has a hanger to conveniently hang on a towel rack in the hotel room. 7. Airline booze is costly, and who doesn't love a refreshing gin and tonic while in flight? This cute carry-on kit allows you to make your own drink at a fraction of the cost. 8. I am a sucker for a super cute luggage tag. The "i'm outta here" tag is the ideal complement to your luggage. 9. I never board a plane without a pair of comfy socks in my carryon. They are a must for cold airplanes and dirty hotel room floors. 10. There's nothing worse than the smell of stale air, someone else's cologne, or worse yet, smoke, in your hotel room. A travel candle masks scents and creates ambience.